The Angriest: Star Trek: Voyager: "Dreadnought"
It is 12 February 1996, and time for another episode of Star Trek: Voyager. 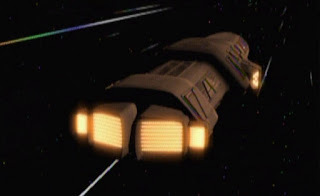 Voyager stumbles upon Dreadnought, a Cardassian-designed weapons platform that had been sabotaged by B'Elanna Torres (Roxann Dawson) during her time with the Maquis but then lost in the Badlands. Now trapped, like Voyager, in the Delta Quadrant, it has accidentally mis-identified a nearby alien planet as its original target. Torres must race against time to re-program Dreadnought before it kills millions of people. "Dreadnought" is a fairly decent episode that has been carved out of a fairly silly premise. One of the main elements that is supposed to distinguish Voyager from its predecessors is the isolation of its characters. They are a lifetime away from the Federation, and all of the various civilizations with which audiences were familiar. Having Voyager stumble upon a Cardassian super-missile in the Delta Quadrant is a leap the series shouldn't have to take. The reasoning for how it got there is weak, and the odds of Voyager and Dreadnought encountering one another when the two ships arrived there months apart and could have headed in any direction in a three-dimensional space beggars belief. While the premise is poor, there's a lot of good in the execution. The interior of the Dreadnought itself is a nice piece of production design, and director LeVar Burton does an excellent job of shooting around it - there's a lot of nicely fluid Steadicam work that keeps the momentum and suspense going. The lighting is quite atmospheric overall, in fact. It gives the episode a nice sort of submarine thriller vibe. Where the episode really excels is in giving some great material to Roxann Dawson, and in she delivering the goods in return. It's a strong Torres-centric episode: she sabotaged Dreadnought back in the Alpha Quadrant, when she was a hot-heated and rebellious terrorist, and now more than a year later she is forced to confront the consequences of her actions. Millions of people are going to die and a world she has never visited because she was so intent on using a massive bomb to kill Cardassians. This sense of self-reflection is enhanced by Dreadnought's computer having Torres' own voice. For the bulk of the hour she is effectively talking to herself. The episode also includes some nice long-term arc stuff around the edges. Ensign Jonas (Raphael Sbarge) continues to sneak information to Seska via the Kazon. Lieutenant Paris (Robert Duncan McNeill) continues his unexplained rebellious streak against his commanding officers. Ensign Wildman (Nancy Hower) gets closer to giving birth - and providing Voyager's first baby. It's all effective stuff. After a shaky beginning - the result of several Season 1 holdovers - Season 2 has developed into a genuinely enjoyable experience. 11 good episodes out of 17 give the season a quality ratio of 65 per cent. Unlike its predecessor, this season really is worth your time.